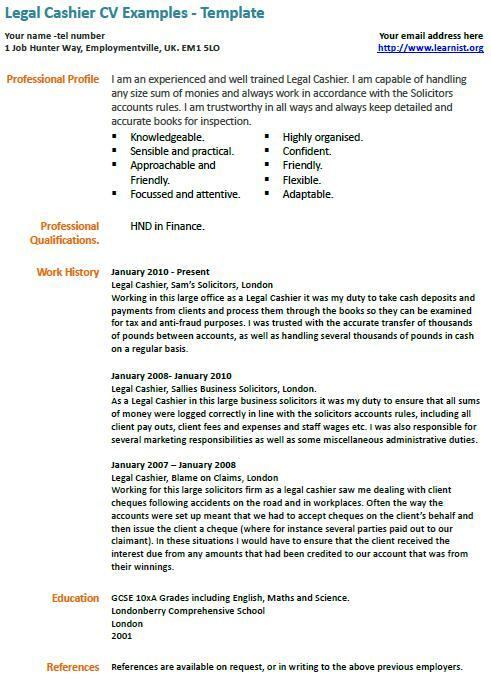 Legal Cashier CV Examples – Template. Amend this CV example as suitable and write your own CV in minutes. I am an experienced and well trained Legal Cashier. I am capable of handling any size sum of monies and always work in accordance with the Solicitors accounts rules. I am trustworthy in all ways and always keep detailed and accurate books for inspection. Working in this large office as a Legal Cashier it was my duty to take cash deposits and payments from clients and process them through the books so they can be examined for tax and anti-fraud purposes. I was trusted with the accurate transfer of thousands of pounds between accounts, as well as handling several thousands of pounds in cash on a regular basis. Legal Cashier, Sallies Business Solicitors, London. As a Legal Cashier in this large business solicitors it was my duty to ensure that all sums of money were logged correctly in line with the solicitors accounts rules, including all client pay outs, client fees and expenses and staff wages etc. I was also responsible for several marketing responsibilities as well as some miscellaneous administrative duties. Working for this large solicitors firm as a legal cashier saw me dealing with client cheques following accidents on the road and in workplaces. Often the way the accounts were set up meant that we had to accept cheques on the client’s behalf and then issue the client a cheque (where for instance several parties paid out to our claimant). In these situations I would have to ensure that the client received the interest due from any amounts that had been credited to our account that was from their winnings.